It’s been said that cleaning with kids in the house is like trying to brush your teeth while eating Oreo cookies. And let’s face it; that feels way too true some days. OK, most days. But since cleaning is a nonnegotiable and kids definitely contribute to what needs cleaning, there’s a surprisingly evident solution: Get kids to take part in the tidying-up process too. Right about now, you’re probably thinking, “Ha! 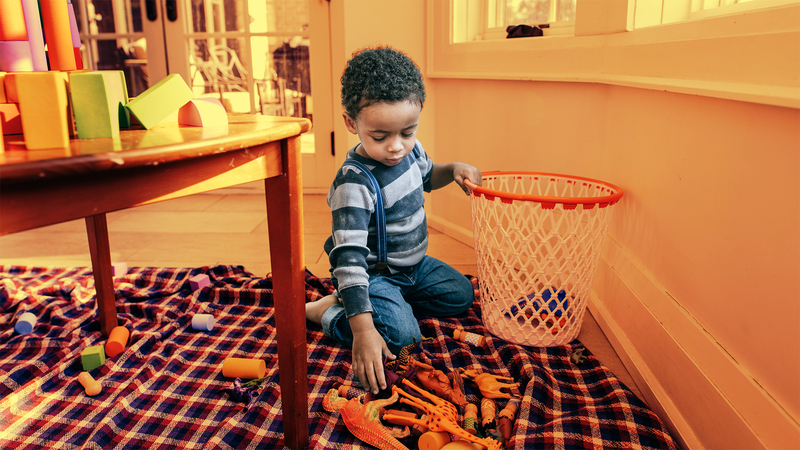 Easier said than done.” We get it — most kids aren’t going to volunteer to sacrifice time with their toys or playing with their sibling to help you straighten up the house. The idea here is that if you can convince your kids to pitch in while they’re little, a habit will hopefully form and you won’t have to beg them to give you a hand. That’s the goal with parenting, right? Give them the tools they need to be successful human beings, and cleaning qualifies. To help you in this noble quest, we’ve compiled a list of genius ways to get your kids exciting about cleaning. May the odds be ever in your favor, Mama. A little encouragement can go a long way when it comes to motivating kids. Be their biggest cheerleader! Resist the urge to go back and redo their work if it’s not perfect. The key here is that you don’t have to praise a poor job, but you should applaud the effort. You can always work on their execution — practice makes perfect, after all — but it’ll be a lot easier to do so if they’re not dragging their feet about helping. When they remember how good if felt to get your praise, they’ll be far more pumped to participate than if the specter of criticism looms in their mind. One of the easiest hacks for getting kids stoked about cleaning is to convince them it’s more like a game than a chore. There are plenty of possibilities too. You could get one of those over-door basketball goals and place their laundry hamper underneath it. Voilà! Dirty clothes are no longer on the floor. You could treat cleaning as a competition between siblings. Voilà! Both rooms are spick-and-span in record time. Kids love playing games, so get creative when considering ways to appeal to their competitive spirit. If there’s one thing kids love more than games, it’s rewards. We’re not suggesting you go out and buy your kids a toy or treat any time they clean their room. Rather, you can create a reward system that relies on things they love at home. For example, if they’re big fans of Mexican food, pledge to make Taco Tuesdays a weekly thing — if they finish their chores that week. Alternately, you could create a point system with various chores representing varying point values. Once they accumulate a certain number of points, they can trade them in for something fun, like being the family member in charge of picking the movie for movie night or naming the new pet goldfish. It’s off to the races! Kids can’t resist running around a million miles a minute, so why not put that energy to use? Give them a task, an allotted time limit and see if they can get the job done before you sound the buzzer. In full disclosure, you may not get the most impeccable cleaning job with this hack. However, if nothing else, it will give you a head start on the cleaning. Although, if you really wanted to, you could incorporate time penalties for cleaning violations! Just remember to keep it light, fun and gamelike so your kids forget they’re actually doing something productive as opposed to playing a cool new game. Maybe they just opened a zoo, but all the animals got out of their enclosures and made a huge mess. Or perhaps they’ve been sent to space as part of a top-secret intergalactic mission. The gist? Use your imagination to encourage theirs. Think outside the box to come up with a make-believe scenario they can truly immerse themselves in. Picking up clothes is fun when you’re pretending every dirty T-shirt is a piece of moon rock! Music can also be a major motivator. If your little one loves to dance, narrow cleaning into more manageable chunks of time by punctuating it with dance breaks. Have your kids pick up all their soft toys, then “Shake It Off” with Taylor Swift. Ask them to organize their closet, then cue up Kidz Bop. Just try to leave them with enough energy to commit to cleaning in between hits. It’s understandable kids can get overwhelmed by the idea of cleaning because it can be overwhelming to us as parents too. One way to lessen the intimidation factor for little ones is to take it task by task. We like the “pick a number” method, where you choose any digit and have your kids pick up that number of toys. You could also use colors, shapes, size or any other qualifier for your kids to focus on as they clean.